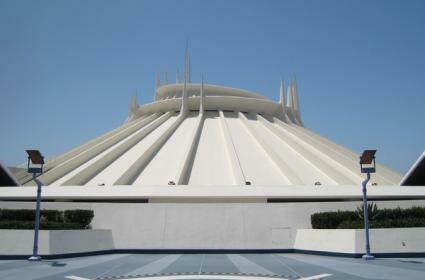 Disney World's Space Mountain got a makeover in 2009. Disney World roller coasters vary in their speed and intensity, providing a diverse array appropriate for the entire family. From the daring heights of Expedition Everest in Disney's Animal Kingdom to the fun and whimsical Big Thunder Mountain Railroad in Frontierland in Magic Kingdom, there's a roller coaster designed for every personality and desired level of thrill. Roller coasters are not for the faint of heart, with their plummeting drops and heart racing speeds. However, Disney World has managed to keep them family friendly enough that they appeal to both small children and daredevil kids at heart. Their parks also have one of the best safety track records in the theme park business, which means you can trust what you're riding in as you spend your vacation zooming by. Magic Kingdom, Disney World's original theme park, is home to Space Mountain (in Tomorrowland). This space shuttle themed ride takes riders through a gorgeous view of outer space before launching them into a fast-moving orbit accompanied by rock music. It's a smooth ride with moderate drops and lots of speed. Combine this with the darkness factor that allows you to see stars and galaxies but never an inch of roller coaster track, and you have an out of this world experience that shouldn't be missed. Big Thunder Mountain Railroad, found in Frontierland, is themed as a runaway mine train. Climb up a steep incline during an earthquake, race past mountain goats and saloons, and bump along this wild west adventure that is great for younger guests but still lots of fun for the older ones. Disney's Animal Kingdom opened in the 1990s, and its newest thrill ride is Expedition Everest. This one is themed after Himalayan explorers determined to conquer the great Mount Everest. Guests encounter a snowy adventure, including mythical yetis roaring inside of the massive mountain. If you enjoy the ride forward, you'll surely love it backwards as the trip includes a dramatic drop, tail end first. Aerosmith's Rockin' Rollercoaster is the big thrill at Hollywood Studios. Featuring the famous rock band both in the entrance cue and on the ride itself, brave riders encounter drops and corkscrews, not to mention the 0-60 MPH shoot up the first hill. Aerosmith lovers will adore the music played inside of each car, and everyone will be jazzed by the fun black light décor found inside, themed after a busy Los Angeles freeway. The Test Track at Epcot is one of the most exciting rides found at this park, and is also very educational at the same time. The whole idea is to make you feel like one of the famous crash dummies as you "test drive" a car through various road conditions - ice, heat and corrosion. Feel what it's like to have your brakes go out, to drive at top speeds, and to make sharp turns in a split second decision. The ride queue features real crash dummies and car parts being tested. The entire ride is sponsored by General Motors and usually attracts a large line. Since Disney World roller coasters are the biggest draw of the parks for a lot of people, you'll want to try to beat the crowds, especially if you will be visiting in the summer or during Christmas vacation. The best way to avoid long lines is to take advantage of Disney's Fast Pass System. It works like a reservation, virtually waiting in line for you after you have swiped your admission ticket for a fast pass. Return at the instructed time window, and you get in a much shorter line and on with your day. If your favorite ride has run out of fast passes (which often happens on a busy day), then try to hit the roller coasters during a parade, stage show, or other special event happening in the park. Early afternoon and late evening is another great time, as many families return to the hotels to nap their children. No matter how you work it, Disney's roller coasters are worth the wait, and you'll cherish the laughter and memories your family will have from your thrill ride adventures.